How can US foreign policy be explained in a systematic and rational way? 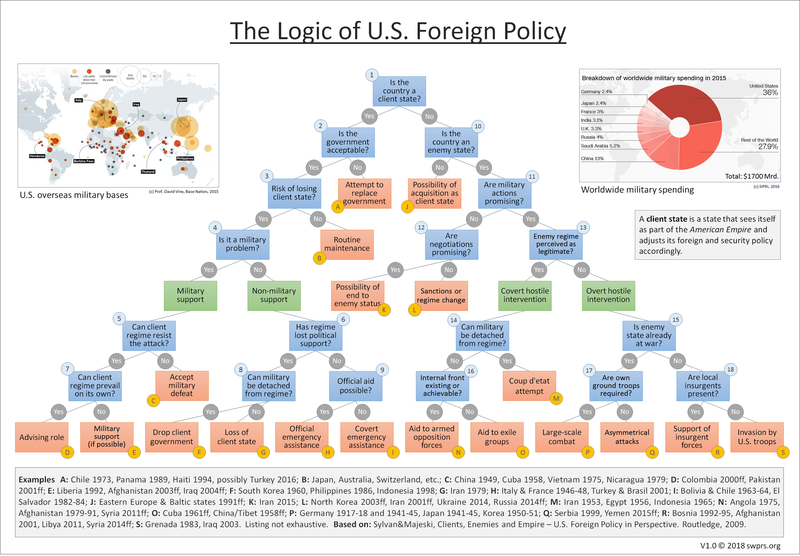 The following chart – based on a model developed by political science professors David Sylvan and Stephen Majeski – reveals the longstanding imperial logic behind U.S. diplomatic and military interventions around the globe. The Logic of US Foreign Policy by Sylvan and Majeski offers a consistent explanation for American interventions of the past several decades. The usual explanations – by proponents as well as opponents of these wars – are, however, mostly to be seen as pretexts, rationalizations or at best partial aspects, as the following overview shows. Defending democracy and human rights: This classical justification is not very convincing, since democratic governments have been overthrown (A, M, N), autocrats have been supported (E and I), human rights and international law have been violated or violations tolerated by the US. Combating terrorism: Paramilitary groups – including Islamist organizations – have been used for decades to eliminate opposing regimes (N and R). Specific threats or aggressions against the US: Most of these scenarios turned out to be incorrect (or made up) in retrospect (No. 13; e.g. Tonkin, incubator and WMD claims). Raw materials (especially oil and gas): Even enemy states generally want to sell their raw materials to the West, but are prevented from doing so by means of sanctions or war. This is because from an imperial point of view, their independence and influence is seen as a threat. Was the Iraq war about oil? Hardly. Already prior to 2003, Iraq had supplied its oil mainly to the West; the Iraqi oil sector was not privatized after the war, and production licences were also issued to corporations in France, Russia and China (which opposed the war). Was the Syrian war about natural gas pipelines? No (see here and here). The plans for regime change and war against geopolitically independent Syria had existed for decades and were to be implemented in the course of the so-called “Arab Spring”. Was the Afghanistan war about a natural gas pipeline? No. The Taliban were interested in the TAPI pipeline; it was delayed by the war and is scheduled to go into operation in 2019. Was the Libya war about oil reserves? No. Libya was already one of Europe’s most important suppliers under Gaddafi; security of supply has declined significantly since then. Libya, however, pursued an independent Africa policy (financed by its oil wealth), which collided with the plans of the US (and France). Was the Iranian regime change in 1953 about the nationalization of oil? No. The US tried to mediate in the British-Iranian oil dispute and urged the British to compromise. Only when Iranian Prime Minister Mossadegh cooperated with the Communist Tudeh Party and opened the country to the Soviet Union did the CIA intervene. Iranian oil, however, remained nationalized even after the coup. What was the Yemen War about? About keeping Yemen as a US/Saudi client state. What was the coup attempt in Venezuela about? See Venezuela: It’s Not About Oil. Could renewable energies solve the raw materials problem? Hardly, because renewable energies, storage technologies and high-tech electronics require rare-earth metals, 97% of which are currently produced by China, and conflict minerals such as coltan from the Congo. The “Petro-Dollar”: The petro-dollar thesis was developed in the course of the Iraq war. However, the significance of the US dollar does not derive from oil, but from US economic power. While many states naturally prefer the stable dollar for their raw material exports, enemy states often have to switch to other currencies in order to circumvent sanctions (L, e.g. Iran). Capitalism: In 1917 Lenin described “imperialism as the highest stage of capitalism,” since capitalist states would have to conquer markets for their overproduction. However, even enemy states want to trade with the West, but are prevented from doing so by sanctions or war. Moreover, pre-capitalist states like Rome and Spain and even anti-capitalist states like the Soviet Union had already waged imperial wars. National debt: The national debt is also no reason for US wars, as the US is creating its own money by using the Fed. Moreover, wars themselves contribute immensely to national “debt”. Arms industry: In 1961 US President Eisenhower warned of the increasing influence of the “military-industrial complex”. The latter is certainly one of the main profiteers of wars, but this applies as well to countries such as Russia, China, Sweden and Switzerland. Moreover, US wars are not arbitrary, but follow an imperial logic; after all, even the Roman Empire did not conduct its wars merely to produce as many weapons as possible. Retired U.S. General Wesley Clark about the “seven countries in five years” strategy (2007).